I've gotten a couple of people in my private life into tarot- which is a process that usually begins with the "Oooh, what are those?" question when they catch sight of my decks in storage or in use. Should they make it past passing curiosity or immediate fear (a sad but few still react this way), I find that tarot is immediately appealing as an easily accessible resource they can work into their lives. Unfortunately, the interest often starts to wane when they do manage to pick out their first deck and suddenly there's 78 cards with weird imagery before them and too often a LWB that's just the most basic of keyword meanings. They know there's more, especially knowing me who tends to wax poetic about some of the cards and tarot as a practice. It's just very hard to get there from just the information the deck comes with. As with most things worthwhile, it takes a little work. And we've got options! There is no one specific route to mastering the tarot- any anyone who implies there is should be met with disbelief and a handwave. In the end, tarot is a personal journey and the only thing that can be promised is that continued practice builds skill. How you learn and practice, is your choice! These are some strategies that worked for me, and some that I came across and would have liked to know about as a tarot reading baby. You should probably have a tarot deck.... or not. Maybe you want to start out with an oracle deck, or even lenormand or playing cards. Decide which route you want to go. The tips here are primarily for tarot learners, but it's worth a look to see which might apply to other forms of cartomancy. THE HIEROPHANT OR WHAT TRADITION OF TAROT WILL YOU BEGIN IN? If you do go with a tarot deck, it's best practice to understand what tradition the deck creators were working with. The most common are Rider-Waite-Smith clones(often abbreviated RWS), Thoth, and Marseilles. Most decks out there will likely be RWS derived and this is the most recommended tradition for those just starting out with tarot. Not that it's better or necessarily easier, I believe it's just a matter availability. You can always find a RWS-based decks that fits you perfectly if the original just isn't your bag. If you are looking for decks that speak to a multiplicity of experiences, I recommend browsing my Tarot of the QTPOC list for some fabulous candidates. Alright, now to on to the beginner's tarot tips. Pull a tarot card from your deck everyday (or as close to that). Take a picture of it, meditate, journal, or stare at it. Come back to it at different times in the day. Did something change? Did some part of your day feel relevant to the card? Did you notice something new. Think of the one-card-a-day strategy like a daily multi-vitamin. It keeps you vested in your practice as well as grows your familiarity with each of the cards in your deck. So you pull the Three of Cups and the LWB (little white book) your deck comes with is all about celebrating the good times but you have a feeling that it's really about your new and deeply expansive journey into polyamorous romantic relationships. Who do you trust? The writer of the LWB (who you most likely don't know from Adam) or your intuition? How about when you draw the Knight of Wands and your trusted bestselling tarot book is talking about some redheaded young man about to sweep into your life but you feel that the card you drew is more about your giving into creative passion and going all in for that project you've been putting off? One of the most magical things about tarot practice for me is that it taught me to believe myself. Every card will speak to you differently- heck the same card today might bear a different message next week. That's even before you work with different decks that play around with traditional meanings. In the end, what the tarot card means to you is what the tarot card means... at least right then. There might come a time when you hit an absolute blank, and it is perfectly okay to reach out to a resource, but when you know it's right... KNOW IT. Teamwork makes the dream work. Or some such like that. One of the best ways to get out of your own head is to ask someone else! Coming into tarot for the first time, I found that my understanding of the cards really deepened from listening to or reading someone else's interpretation of a reading I'd done. I recommend first joining or starting a group with folks who are interested in coming to tarot from a space like yours. For example, I got really lucky starting out and was part a Facebook group created for and by women and femmes of color learning from the same deck. Securing and creating that space was so beautiful, and we often posted our readings and offered up interpretations for others when requested. 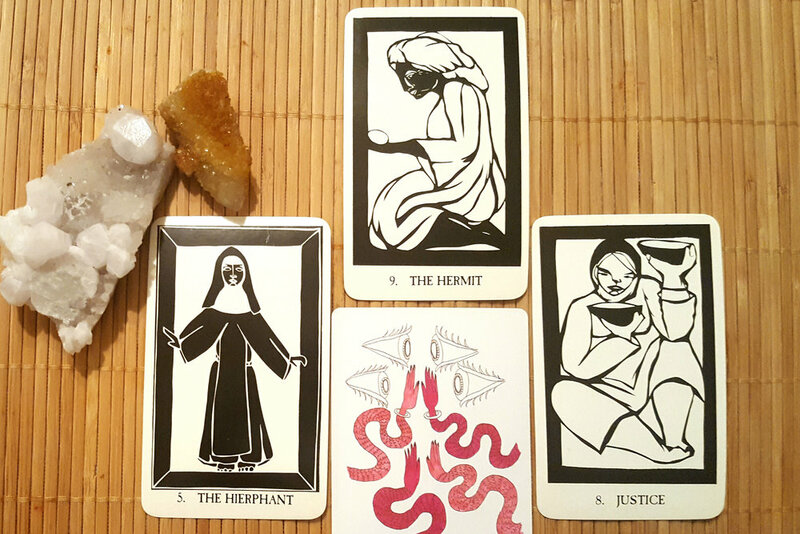 I'm not sure that I would have stuck with tarot if not for that group- considering the horror stories that are around about being young, black, and queer and just starting out in tarot. From there, I felt secure enough to move on to larger tarot groups and networks as I'd had some practice gaining confidence in my voice and tarot perspective. As you widen the net, you broaden the horizons of tarot understanding. It was very cool to notice all the things that were similar or different in our understanding of not only the cards by themselves, but how they came together in the reading. Importantly, I also learned how to disagree with someone else's understanding of the cards. Not all interpretations will fit you. Learning to listen to when your intuition says yes and when it says no in a group or partnered setting is a lesson that will continue to be invaluable for the rest of your tarot journey. Well there's a reason it's called tarot reading, right? So read! There are plenty of tarot books out there in the world and you should get to know them. I'm by no means implying that you should read all of them, be discerning about what you're looking for and then go find a book that addresses that. I'll keep saying this. Tarot is first and foremost a personal journey, and the path to the information you're looking for can get so much more specific than what does a particular card mean. For example, you might be having a grand old time with most of the cards but the court cards are beginning to cause hair loss. There's a tarot book for that! You want to get an understanding of the Ten of Cups that isn't about finding fullfillment in happy cishet families. There's a tarot book for that! Perhaps you're interested in books that get away from a card-meaning mission and instead help you dig deeper not just in the deck but in yourself. There's a tarot book for that! Or maybe you are super cool and you are coming to tarot as an additional tool to enrich your spellwork. There's a tarot book for that! By the way, tarot has been around for long enough that a lot of beginner and intermediate tarot books can be found in your local library or thrift/used bookstore. Tarot is meant to be accessible, and finances should not a barrier create. So don't stop at hard copy books. There are so many brilliant folks out there in the interwebs doing in-depth work with specific cards or decks. Bookmark those pages for additional reference and review often to enrich and challenge your own understanding. There's absolutely no reason that your library has to be a physical one. Tarot is for you, build your knowledge bank however you want to. Here's something I wish someone had told me at the start. You absolutely do not have to memorize every single thing about the tarot, and actually you probably can't. Not even if you read every page of Holistic Tarot, a 896-page tarot goldmine by Benebell Wen. While learning how elemental dignities, art history, crystal and astrological associations, numerology, and how the Tree of Life relates to the tarot is very cool, you do not have to know or be interested in knowing all that to begin using the tarot for yourself. Take your time and integrate all the other accessories as you are ready to. Yes, they do provide nice complements to your readings but before anyone else's input, it's important to first trust yourself and your understanding. Additionally, if you never take an interest in the supplemental stuff, that's okay too. While this knowledge may be useful should you ever start reading for others professionally, it isn't so crucial when you're just getting to know the cards for your own growth and development. This is your personal tarot journey. Use one or combine some of these strategies. Use none of these and go a completely different way. As long as you keep up the practice, how you do that is totally up to you!